Question 1 in the A level sociology families and households ‘topics’ exam will be out of 10 marks ask you to ‘outline and explains’ two things (reasons/ ways/ criticisms for example). 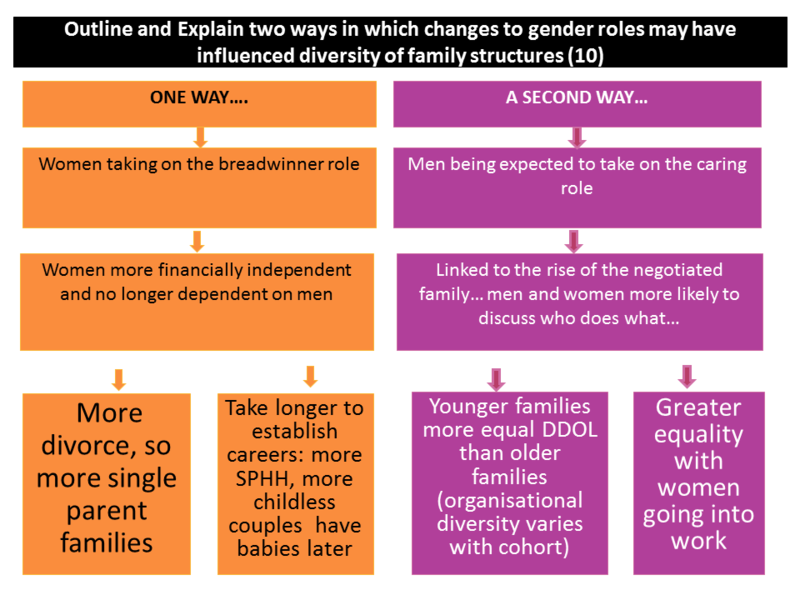 Outline two distinct ‘ways’, and they need to be different to each other – an obvious strategy here for one ‘way’ to focus on women’s roles, and the other on men’s roles. For each ‘way you need to clearly show how a change to a gender role has affected families, increasing diversity. For each reason/ criticism you need to explain the effect showing ‘chains of causality’. An example of how you might develop ‘way one’ above. Girls have overtaken boys in education, most people in university are girls and most households are dual income households. This has led to a decline of the traditional expressive role and the idea of women as carers, such that most women now choose to spend their 20s building their careers and have babies in their 30s, meaning there is only time for one or two children rather than two or three. Some women, of course, remain childless. This is reflected in the Total Fertility Rate – for women in their 30s has declined, but it has actually increased for women in their 30s and 40s because of the above changes. Other changes to family life include an increase in divorce as women are no longer dependent on men financially – which means an increase in single parent families, mainly headed by women, and single person households mostly inhabited by men, following divorce. You could include some names in there, but this is not essential to get into the top mark band. Concepts/ theories are more important.